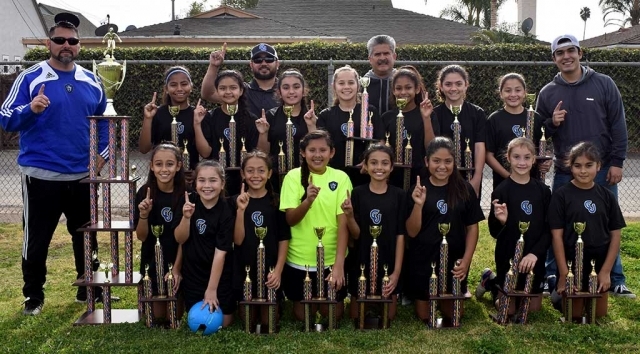 California United U-11 Girls Champions. Top row (l-r): Marlene Gonzales, Fatima Alvarado, Isabel Hernandez, Mikayla McKenzie, Jadon Rodriguez, Athena Sanchez, & Jessica Rodriguez. Bottom row (l-r): Ashley Hernandez, Kari Terrazas, Tori Pina, Gabi Martinez, Miley Tello, Lexi Pina, Brooke Nunez & Kim Manriquez. Coaches(l-r): Junior Lomeli, Tony Hernandez, Cip Martinez & Ruben Rodriguez. Photo courtesy Evelia Hernandez. Oxnard’s goalkeeper was unable to handle Jadon Rodriguez’s blast, giving California United a 1-0 lead. 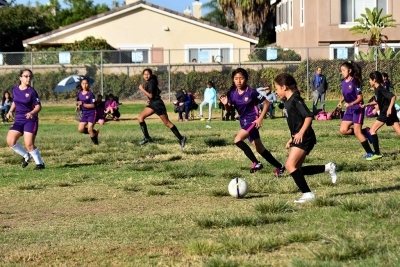 The California United U-11 girls matched up with Oxnard’s’ Nacional team for the OCSL Championship this past weekend. California United came to the game with a 10-0-0 season record and Nacional at 8-2-0 with the only losses coming from California United. It was a tightly contested game that went into the second half in a 0-0 tie. Late in to the second half Jadon Rodriguez was the first to break through with a goal and Marlene Gonzales scored a few minutes later to seal the game for California United. The defense played a strong game as usual, allowing very few shots near the goal and keeping the opponents shooting from the outside. The few shots that did get by were stopped by Gabi Martinez who had a full game shutout and a great second half stop to keep it scoreless. Congratulations to the California United players on this Championship! These athletes have worked very hard and put in lots of time to achieve back to back undefeated Championships and we look forward to another great year. After three weeks off due to wildfires on Wednesday, January 3rd Fillmore Flashes Varsity started off the week by defeating Dos Pueblos 5-1. Goals were made by Jose Valdez 2, Yobani Figueroa 1, Alex Rodriquez 1 goal and 1 assist, Joel Garza 1 goal and 1 assist, lastly, Carlos Vargas with 2 assist. On Friday, January 5th Flashes opened up League away against the Carpenteria Warriors. Final scores were Fillmore’s Frosh lost 0-1, Fillmore’s JV won 5-0 against Carpenteria and Varsity won 0-3 against Carpenteria. Upcoming games on Wednesday, January 10th Fillmore will host long time rival Santa Paula. Games begin as follows: Frosh 3:00pm, JV 4:30pm, Varsity 6:00pm. and Friday January 12th Fillmore will host Grace Brethren same times. 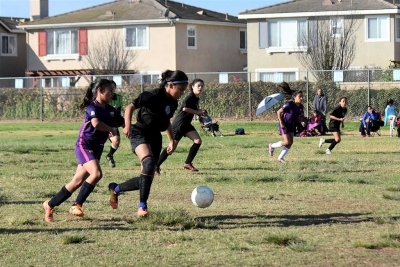 Thursday, January, 4th Fillmore Flashes Girls Soccer hosted Nordoff High. 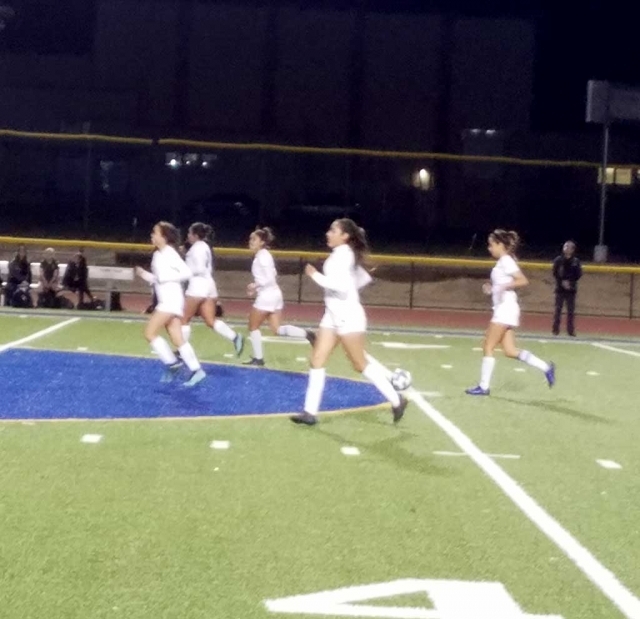 Flashes JV tied Nordoff 1-1, with alone goal made by Isabella Vaca. 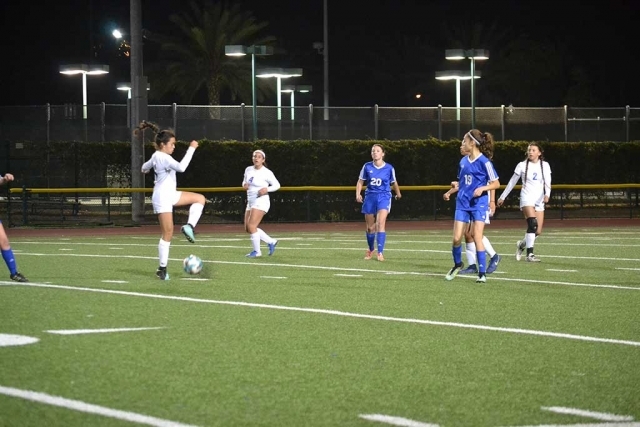 Flashes Varsity defeated Nordoff 2-0 with goals made by Andrea Marruffo and Jennifer Cruz. 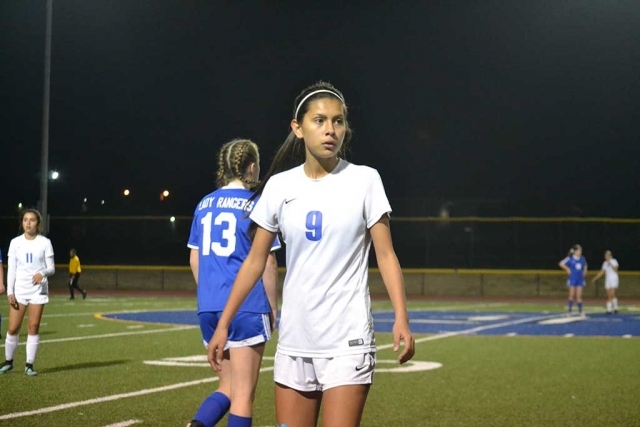 Goal Keeper Aaliyah Lopez had 5 saves for her second consecutive shut out. Next week the Flashes will take on Bishop Diego Thursday, January 11th 6:00pm at Fillmore High School. Stats and photos courtesy Coach Omero Martinez. 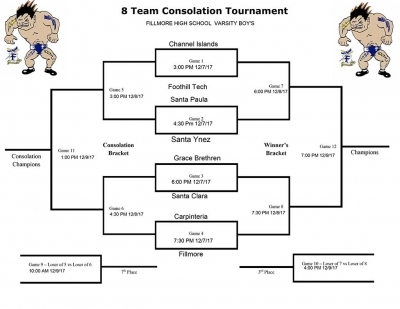 Saturday, January 13th Fillmore Flashes JV Boys Wrestling will compete in tournament at Hueneme High. Fillmore Flashes Girls wrestling will be at a tournament in West Torrance. 54th Annual Ventura Kiwanis Tournament: Fillmore 34, Ventura 96 was the final. Flashes started game off playing extremely well, played hard for the first half , eventually succumbing to a good Ventura team. 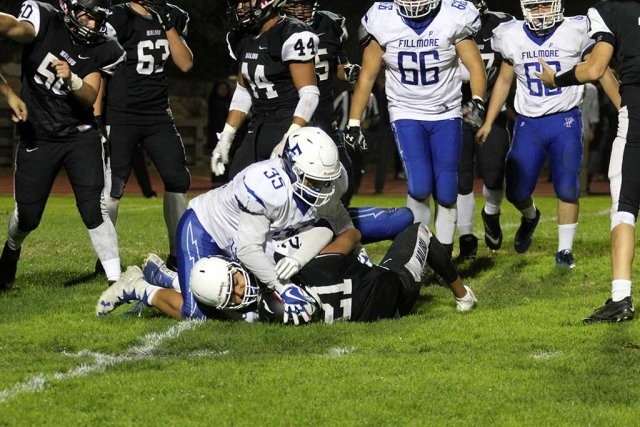 The Flashes never gave up, Ian Morris was solid on defense, putting pressure on the ball at all times, Jake Saviers, Noah Padilla, Roy Esquivel and Daniel Gonzales also played well on the defensive side as well. Leading for Flashes. Game Stats: Jordan Padilla, 7 points, 4 rebounds and 1 steal, Jake Saviers, 6 points, 4 rebounds, and 1 steal, Adrian Casas, 5 points, Ian Morris, 4 points, 1 rebound, 1 assist, 3 steals, Daniel Gonzales, 4 points, 6 rebounds, 1 assist, 1 steal, Roy Esquivel, 3 points, 5 rebounds, 2 assists, 2 steals, Daniel Munoz, 2 points, 2 rebounds, Junior Maldonaldo, 3 points, 1 rebound. 12/29/17 - FHS 49, Pacifica 73: The Flashes came out and played a great first half vs Pacifica. Costly turnovers and some missed opportunities cost the Flashes down the stretch to secure the victory. The boys played hard throughout, fighting till the final whistle blew. The Flashes continue to get better and better each game out, growing as basketball players and as a team. The Flashes shot 43% from three point range, (6-14), and 85% from Free throw line ( 11-13), just not enough to seal the victory Leading for Fillmore Daniel Gonzales, 16 points, 7 rebounds, 3 assist, 1 block, 1 steal, Ian Morris, 6 points, 3 rebounds, 1 assist, 1 steal, Noah Padilla, 6 points, 5 rebounds, Jordan Padilla, 6 points, 4 rebounds, 3 steals, Junior Maldonado, 5 points, 3 rebounds, 1 steal, 1 assist, Jaysson Carrillo, 6 points, Roy Esquivel, 2 points, 4 rebounds, 3 assists, 2 steals, 1 block, Andres Maldonado, 2 points, 1 rebound, 1 steal, Jake Saviers, 4 rebounds, 2 assists, 1 steal. 12/29/17 - FHS 45, Moorpark 68: Flashes started strong, played a good first half before falling to Moorpark. Leading For Flashes Junior Maldonado, 11 points, 3 rebounds , 1 steal, Noah Padilla, 10m points, 1 rebound, 2 steals, Ian Morris, 6 points, 3 rebounds, 3 assists, Roy Esquivel, 6 points, 4 rebounds, 3 assists, Jake Saviers, 5 points, 7 rebounds, 1 steal, Daniel Gonzales, 2 points, 12 rebounds, 1 block, 3 steals. Game started with SP going on an 8-0 run, then leading 11-4 at one point before the Flashes took control for good. The Flashes didn’t panic, weathered the storm, and came home with the victory . The Flashes played great man to man defense the entire game, shutting down their leading scorer, Jake Saviers, Noah Padilla, Junior Maldonado, Ian Morris, Roy Esquivel, Daniel Gonzales leading the defensive charge. The boys grew up in the tournament a bit, played extremely well today as a unit. Leading for Fillmore Daniel Gonzales, 26 points, 18 rebounds, 2 steals, Noah Padilla, 9 points, 4 rebounds, 1 assist, 1 block, 1 steal, Jake Saviers, 8 points, 7 rebounds, 2 assists, 2 steals, Junior Maldonado, 8 points, 2 rebounds, 1 assist, 1 steal, Ian Morris, 8 points, 2 rebounds, 2 assists, 1 steal, Roy Esquivel, 7 points, 3 rebounds, 3 assists, 2 steals. Flashes are 2-8 on season, next Game 1/5/17 Home VS Pacifica. Submitted by Coach Omero. 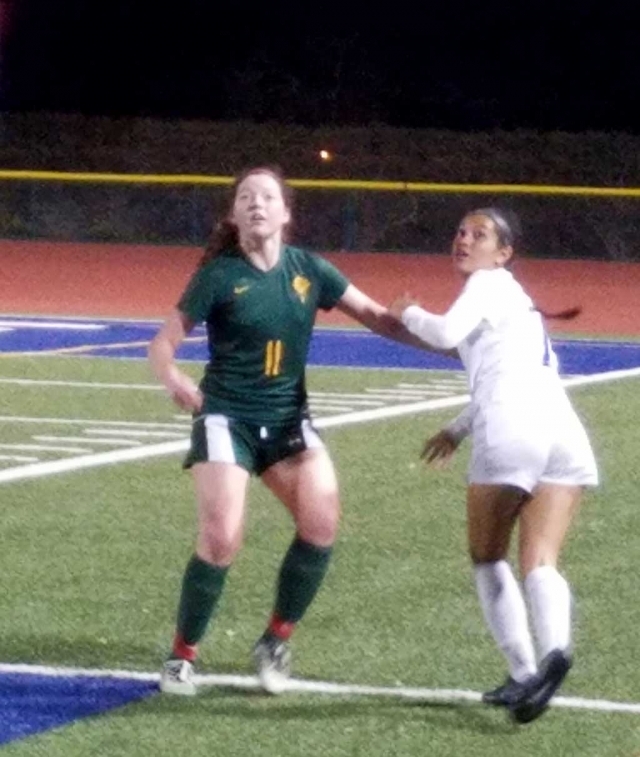 On Tuesday, January 2nd Fillmore hosted La Reina. Fillmore came out strong scoring 4 goals in the first half and adding two more in the second half. 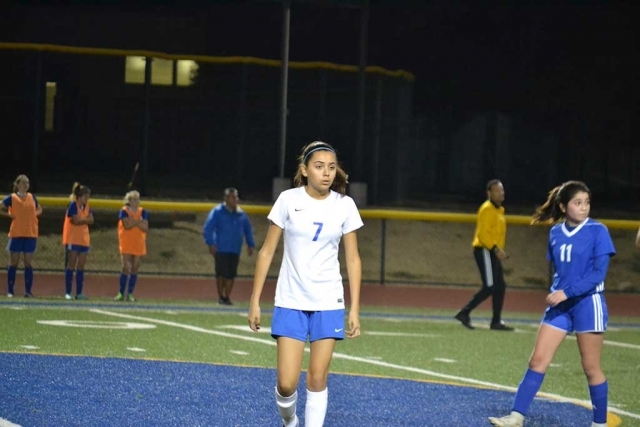 Ana Covarrubias led the team with 3 goals, Alexsys Covarrubias, Aaliyah Alfaro, and Jennifer Cruz each had a goal. Andrea Marruffo had three assist. 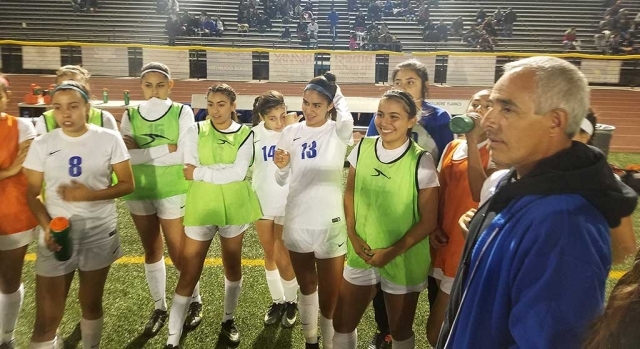 Yareli Cobian, Emely Garibay, Kayla Martinez, Alexis Mejia played well defensively. Final score 6-0 Fillmore. Come out and support the Lady Flashes on Thursday, January 4th as they host Nordoff JV begins at 4:30pm and Varsity 6:00pm. Photos courtesy Coach Omero. Saturday, January 6th girls will be wrestling in the Santa Paula Girls Duals Tournament. The boys will be wrestling at home against a tough Valencia High School to start league competition on Tuesday, January 9th. Fillmore Condor Cross Country Team pictured at the USATF Jr. Olympic Cross Country National Championships Saturday, December 9th . (l-r) (top row) Lindsey Ramirez, Diego Rodriguez, Leah Barragan, Niza Laureano, Jordyn Walla, (bottom row) Ayden Marquez, Santiago Felix, Genevieve Abbitt, Paola Estrada, Emily Arriaga, Carolina Garcia and Abel Arana. Photo Courtesy Erika Arana. 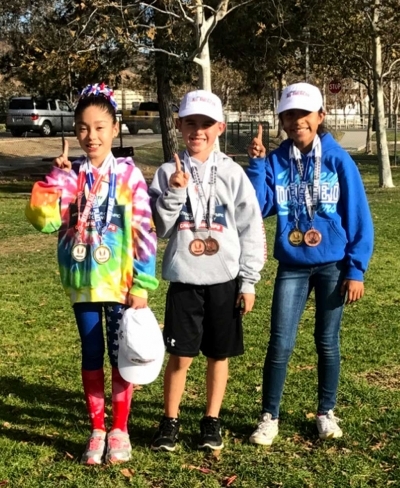 (l-r) Paola Estrada, Ayden Marquez and Niza Lauerano who were named All American Athletes at the USATF Jr. Olympic Cross Country National Championships. Photo Courtesy Erika Arana. 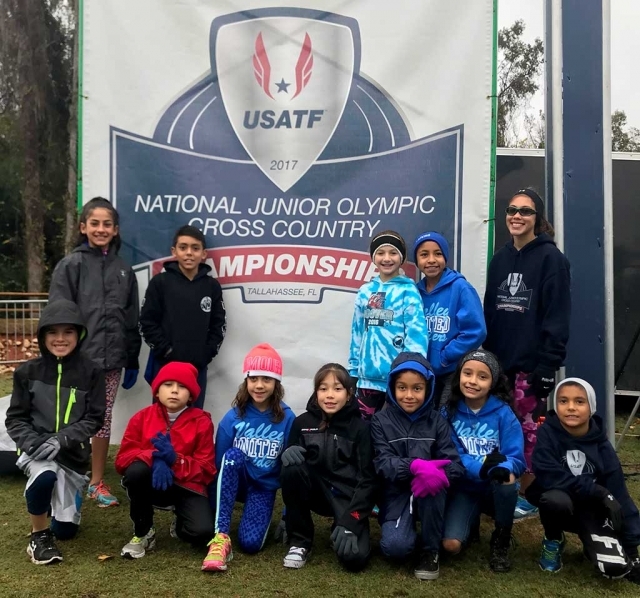 The Fillmore Condors Cross Country team concluded their 2017 season by participating in the USA Track and Field Junior Olympics National Cross Country Championships on Saturday, December 9th. Fillmore Condors Cross Country is a non-profit organization under Heritage Valley Blazers Inc. Twelve local athletes from Fillmore and Santa Paula ranging in ages 7-14 traveled across the country to the rare cold winter 40 degree temperatures of Tallahassee, Florida to compete at the 100+ acres known as the premiere cross country facility at Apalachee Regional Park. This multi-use park includes one of the nation’s few sites designed specifically for cross country running. The pristine trail features numerous course/distance options through the rolling hills, lowlands and pine forests. The trail was designed to give runners the opportunity to run on several types of surfaces. The athletes qualified for the event by finishing in the top eight of the Valley Youth Conference and finishing in the top 30 individually or being a member of the top three teams of the USATF Jr. Olympics Region 15 Championship race, that was held on November 19th in Central Park, Santa Clarita. The Condors joined other area runners to form Valley United Striders. Condor representatives were Genevieve Abbitt, Abel Arana, Emily Arriaga, Leah Barragan, Paola Estrada, Santiago Felix, Carolina Garcia, Niza Laureano, Ayden Marquez, Lindsey Ramirez, Diego Rodriguez and Jordyn Walla. The team’s highest honors this season were won by Paola Estrada, who earned a second place 7:49.7 finish and title of “USATF Jr. Olympic All American” in the National Championship which included 198 runners in her division. She was Valley Youth Conference Champion and Valley United Striders number one runner for her team and earned a 1st place team championship along with her teammates Genevieve Abbitt and Emily Arriaga. The girls 8 & under divisions ran 1.24 mile (2,000 meter) race. First time runner, Ayden Marquez was Valley United Striders number 2 runner to cross the finish line with a 7:57.5, 23rd place finish and title of “USATF Jr. Olympic All American in the National Championship which included 239 runners in his division. Together with his teammates, Abel Arana and Santiago Felix, they earned a 3rd place team finish, only one point short of 2nd place. The boys 8 & under division ran 1.24 mile (2,000 meter) race. Niza Laureano who was the girls 9 & 10 years old Valley Youth Conference Champion, crossed the finish line in 10th place with a time of 11:17.6. She earned a 1st place team championship and the title of “USATF Jr. Olympic All American” in the National Championship. Leah Barragan also helped her “B” team snag a 10th place team finish with 302 runners in their 1.86 mile (3,000 meter) race. In the girls 11 & 12 year old division, both Lindsey Ramirez and Carolina Garcia helped their teammates earn 3rd place team medal in their race of 369 runners. Diego Rodriguez’s boys 11 & 12 year old division race, consisted of 218 runners. All three athletes ran 1.86 mile (3,000 meter) races. 373 runners were in the girls 13 & 14 year old division with Condor alumni, Jordyn Walla. It was the second largest group competing that day, she and her teammates earned 7th place and ran 2.48 mile (4,000 meter) race. 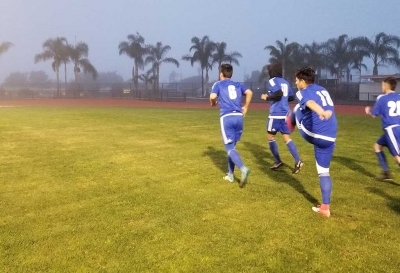 The Condors are coached by Temo Laureano, Philip Ramirez, Israel Estrada, Victor Rodriguez and Jared Perez, who stated, “Every year, we know our athletes will go far. They push themselves daily with one goal in mind and that’s December. We are proud of every single one of them!” The Condors Team President Erika Arana would like to thank the parents for helping daily throughout the season and the following for sponsoring the Condors and making the team’s dreams become reality: Fro-Yo, East County Carnales, El Hair Studio, El Pescador in Fillmore and Heritage Valley Blazers Track & Field. Fillmore Condor Cross Country Team pictured at the USATF Jr. Olympic Cross Country National Championships Saturday, December 9th left to right top row: Lindsey Ramirez, Diego Rodriguez, Leah Barragan, Niza Laureano, Jordyn Walla Bottom row: Ayden Marquez, Santiago Felix, Genevieve Abbitt, Paola Estrada, Emily Arriaga, Carolina Garcia and Abel Arana. Photo Courtesy Erika Arana, see full story on page 3. 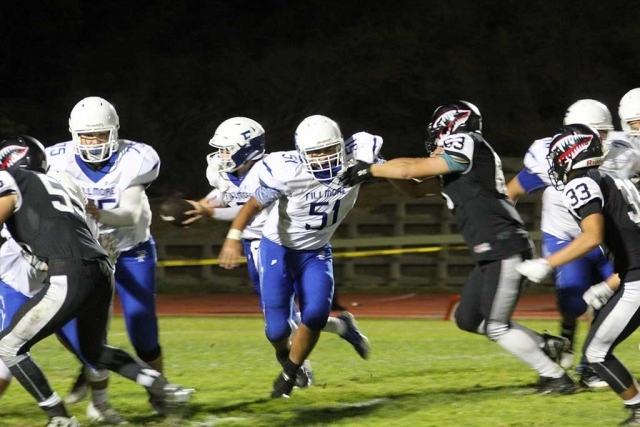 On Thursday, November 39th Fillmore hosted Alemany high school. 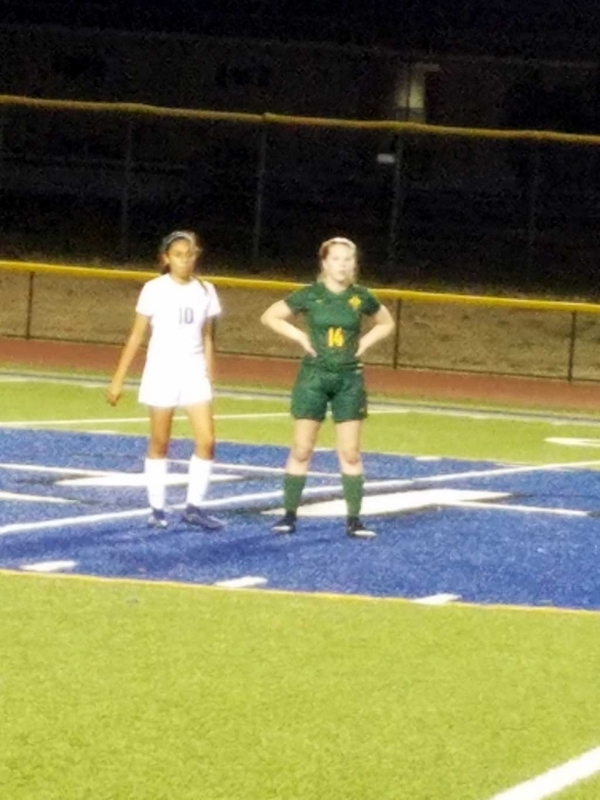 JV tied 1-1 with the sole goal coming from Isabella Vaca on a 20 yard shot. Varsity lost 2-0. Fillmore had 10 shots on goal but could not find the back of the net. 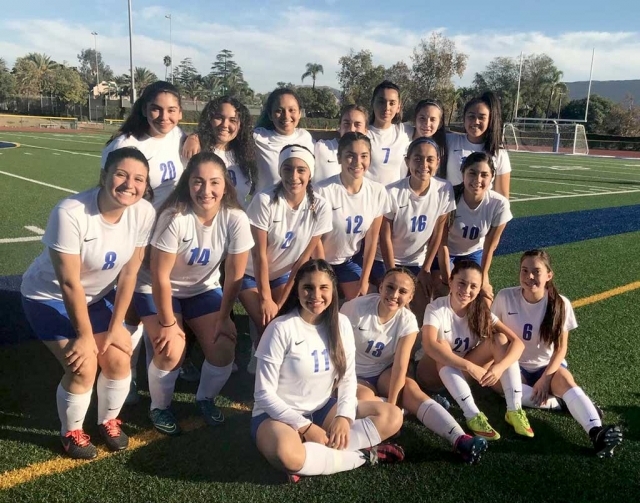 Pictured above is the Fillmore high school JV girl’s soccer team after there 1-1 tie against Alemany. Photo Courtesy Yazu Meza. Submitted by Coach Omero Martinez. The boys couldn’t find a consistent flow and rhythm during the game, ended up losing. Boys played hard through out the contest, just came up short. Leading for the Flashes: Daniel Gonzales, 9 points, 6 rebounds, 3 assists, 2 steal, Andres Maldonado, 8 points, 4 rebounds, 1 steal, Roy Esquivel, 5 points, 5 rebounds, 4 assists, 2 steals, Jake Saviers, 5 points, 7 rebounds, 3 assists, 1 block, Jaysson Carrilllo, 5 points, 1 steal. The boys started well, played hard, they were just out matched during the contest. Battled all the way through. Leading for Flashes: Daniel Gonzales, 9 points, 3 rebounds, 1steal, 1 block, Junior Maldonado, 8 points, 2 rebounds, 1 steal, Roy Esquivel, 6 points, 2 rebounds, 1 steal, 2 assists, Ian Morris, 5 points, 3 rebounds, 1 steal, Jordan Padilla, 4 points, 3 rebounds, 1 steal, 3 assists. The boys started on a high note, and ended on a high note to get their first win of the season. All the boys played extremely well throughout the contest, battling the whole way to secure the win. Leading for Flashes: Daniel Gonzales, 31 points, 11 rebounds, 2 assists, 1 block, 1 steal, Jake Saviers, 16 points, 6 rebounds, 5 assists, 3 steals, Roy Esquivel, 7 points, 3 rebounds, 5 assists, 3 steals, Andres Maldonado, 6 points, 8 rebounds. FHS Boys Varsity record is 1-4 on the season. Next up on the schedule is The Fillmore Winter Tournament, December 7-9 , at FHS First game is Thursday 12/7 VS Carpinteria at 7:30 pm. 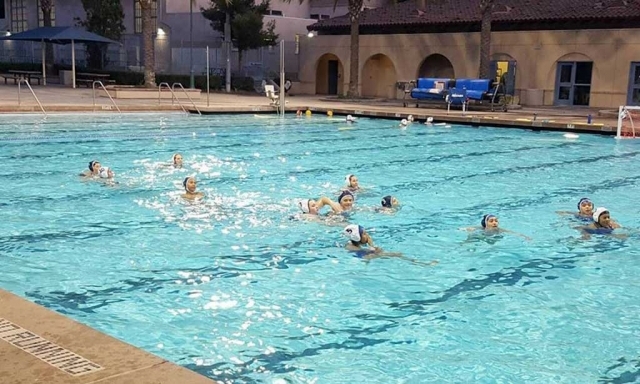 The Fillmore High School Girls Water Polo Team has grown to 32 athletes this year. Coach Lindsey Cota has used her years as an aquatics coach to elevate the numbers and step up the level of play for this upcoming season. November 20, 2017 Boys Varity vs Providence Final score FHS 58, Providence 69. The Varsity boys were close throughout the game, only down 6 at halftime, but just couldn’t seem to get the victory. The boys played hard and fought the entire game, just could not seal the deal and win the game. Leading for FHS: Daniel Gonzales, 20 points, 8 rebounds, 2 blocks, 2 steals, 1 assist; Jordan Padilla, 8 points, 3 rebounds, 2 steals, 1 assist; Junior Maldonado, 6 points, 3 rebounds, 3 steals, 1 assist; Jaysson carrillo, 6 points Roy Esquivel, 4 points,5 rebounds, 1 block, 1 steal, 3 assists; Ian Morris, 4 points, 2 rebounds, 2 steals, 4 assists; Gregory Kraft, 4 points, 2 rebounds; Andres Maldonado, 2 points, 2 rebounds; Noah Padilla, 2 points, 2 rebounds; Daniel Munoz, 2 points, 2 rebounds; Jake Saviers, 1 rebound, 1 block, 1 steal, 1 assist. Fillmore will compete at the Nordhoff tournament Schedule is as follows. Flashes JV boys basketball have began their season at a Carpinteria tournament on 11/29/17 – 12/02/17, and the boys Frosh will be away at a Rio Mesa tournament starting 12/01/17. On Monday, Nov. 20, 2017 Fillmore high school boys soccer hosted Moorpark high for a scrimmage. All three levels played Final scores were: Frosh vs Moorpark 1-0, JV vs Moorpark 4-0, Varsity tied with Moorpark 2-2. Fillmore’s goals were shot by Enrique Gutierrez and were assisted by teammate Joe Garza. On Monday Nov. 27, 2017 Fillmore high visited Royal high school. Final Scores: Frosh vs Royal 4-2, JV vs Royal 3-1, Varsity vs Royal 5-2, all games won by Royal High school. Varsity goals made by Joel Garza. Upcoming game will be Thursday, Nov. 30, 2017 at Camarillo high school. 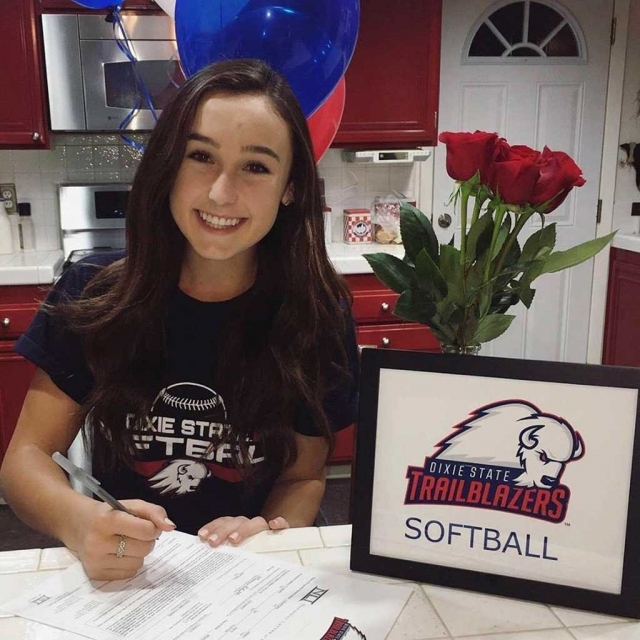 Kasey Crawford officially signed her letter of intent to continue her education as well as play softball Dixie State University. She has received an athletic scholarship as an outfielder. Congratulations Kasey! Fillmore High School wrestling room has made some upgrades which seem to be coming along nicely. Fillmore Flashes girls cross country team huddle together before their race begins. Flashes boys cross country team as they warm up before their race held in Riverside this past weekend. On Saturday, November 10th the boys and girls cross country teams competed at the CIF Southern Section Division 4 Championships in Riverside California. Both races were run over a relatively flat dusty course, formerly home of the Riverside Golf Course. The team's goals was to qualify for next Saturday’s CIF Finals held on the same course. Two heats competed in each race with 20 teams in the boy’s heat and 23 teams in the girl’s heat. The Flashes goal was to finish among the top 12 teams in their respective race and move on to next week's final. The first race of the day featured 21 teams and 158 runners. In this race the girls were led by front running Carissa Rodriguez who finished in 7th place in a time of 18:16.6. 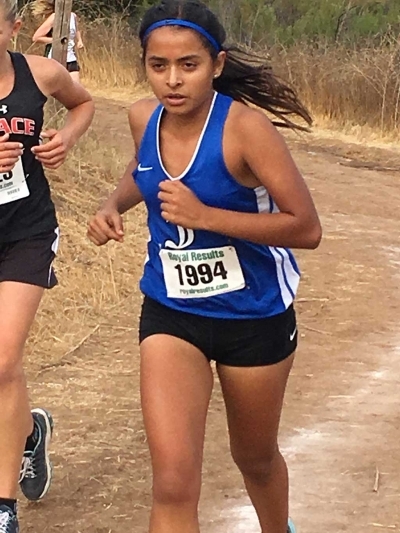 She was followed by Diana Perez 19th in 19:02, Giselle Perez 72nd in 20:05.6, Vanessa Avila 76th in 20:12.4, Anahi Pascual 87th in 20:38.1, Nicole Gonzalez 92nd in 20:51.8, and Cecilia Cisneros 108th in 21:37.6. In the team competition, the girls finished in 10th place thereby earning a place in Saturday’s CIF Finals Meet. The second race of the featured 20 teams and 141 runner. This week the team was led by Everardo Garcia Magana who finished in 7th place and posted an excellent time of 15:51.3. He was followed by Michael Sanchez 10th in 16:01.2, Jesse De La Cruz 49th in 16:46.6, Rey Laureano 61st in 17:00.7, Fabian Del Villar 66th in 17:06.8, and Juan Ramirez 74th in 17:18. In the team competition, the boys finished in 7th place earning a space on the starting line for this weekend’s CIF Finals competition. Both boys and girls cross country teams will return to Riverside on Saturday, November 18 and race in the CIF Division 4 Southern Section Finals. To qualify for and advance to the State Final in Woodward Park in Fresno, on November 25th, they must finish among the top 7 teams in their respective race. 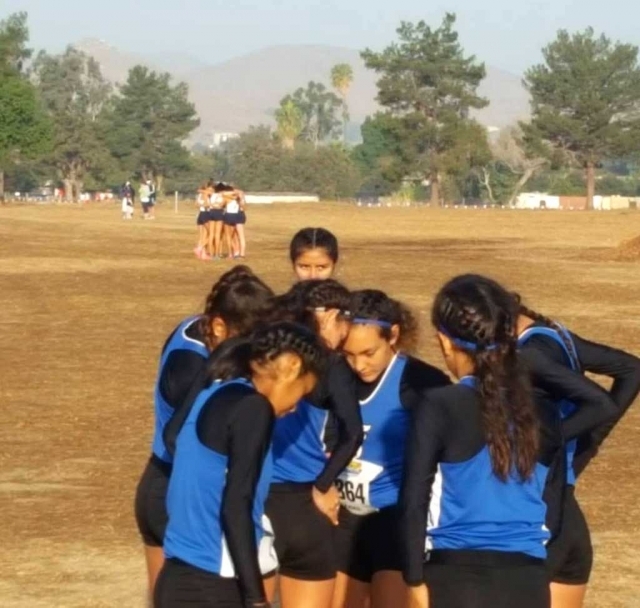 Fillmore Flashes girls gross country team huddle together before their race begins. Flashes goys cross country team as they warm up before their race held in riverside this past weekend. 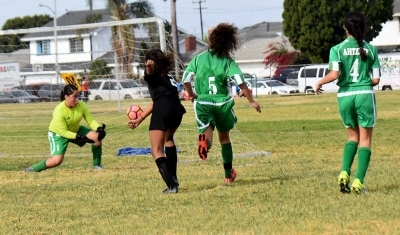 Constantly applying pressure, California United’s Tori Pina sprints up the field as her teammate Jadon Rodriguez (back left) keeps pace looking for a chance to score. Photo Courtesy of Evelia Hernandez. Marlene Gonzales controls the ball at midfield and led the offense with 2 goals this past weekend against Barcelona. Photo courtesy of Evelia Hernandez. (l-r) Oscar Fuentes and Ivan Espino after a great game versus Atlas. Photo by Ivan Espino. 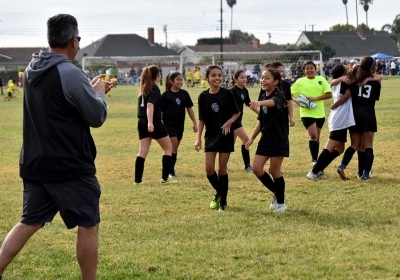 U-11 Girls – After a hard fought 2-0 win over Barcelona this past weekend, the California United team completed another 10-0-0 regular season and will begin the playoffs this upcoming weekend. 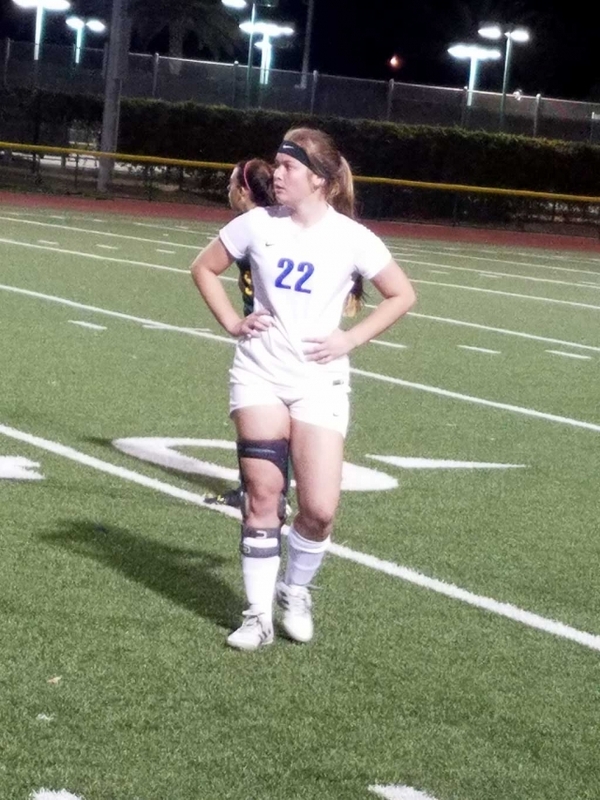 Both goals were scored by Marlene Gonzales as the defense once again came through with a big shutout, as Gaby Martinez and Mikayla McKenzie shared time as goalkeepers. This has been a great season so far, but the girls are focused on a shot at the Championship. U-12 Boys – The California United boys had another close game as they came out on top with a 3-2 victory over Atlas. Leading scorer for the game was Ivan Espino with 2, Oscar Fuentes had 1 goal, while Fernando Pastrana had an assist. Current record 8-0-1. U-13 Girls – The U-13 girls also had a nail biter of a game that ended in a 2-2 tie versus Barcelona. Emily Garcia and Jennifer Abrego were the goal scorers this weekend with one a piece. Current record 6-2-1. California United is growing!! 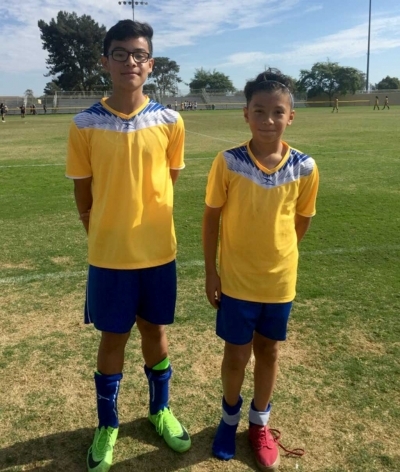 The California United family would like to welcome our newest team, a U-10 Girls squad being coached by the husband and wife tandem of David and Nancy Vaca. They have begun their training and the team looks focused to start competing. Welcome! 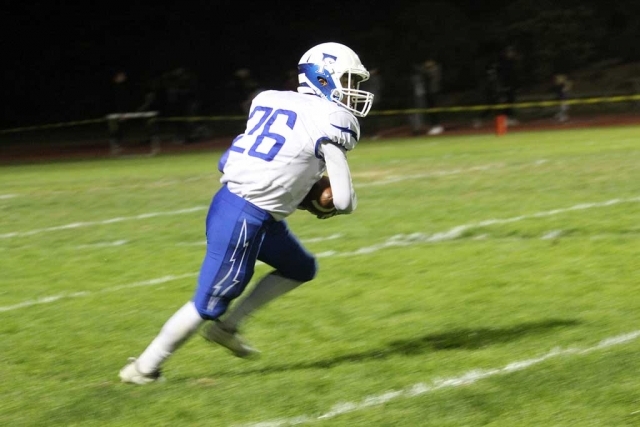 On Friday, November 3rd Fillmore High School Varsity was away at Malibu. 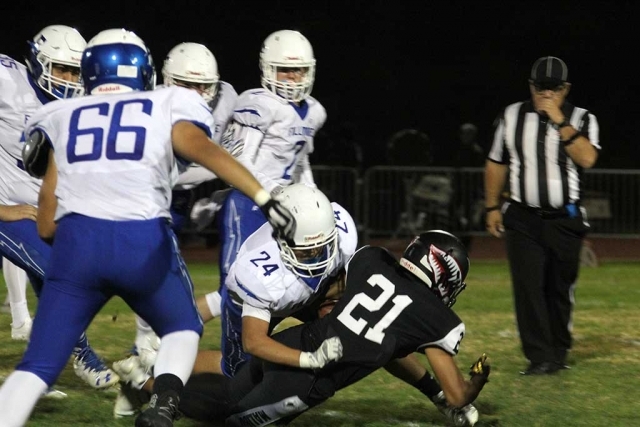 Fillmore fell short this week to the Sharks with a final score of 21-20. 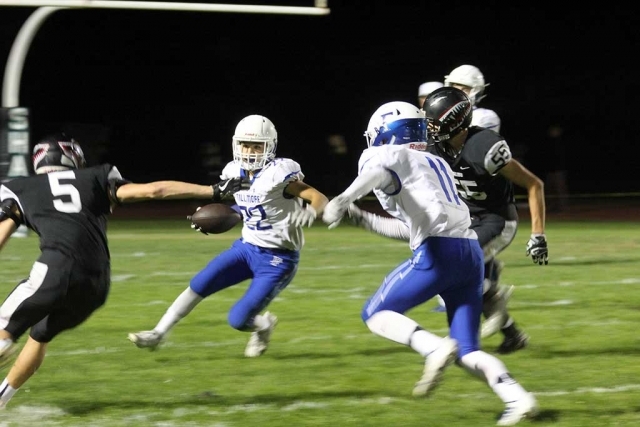 Fillmore Flashes Football photos courtesy Crystal Gurrola. 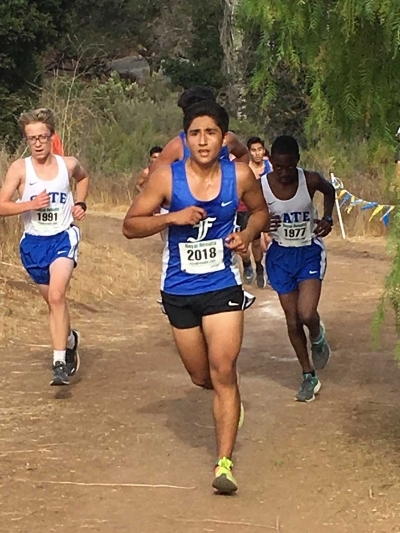 FHS Cross Country’s Jorge Acevedo competing at the Lake Casitas Course in Ojai. Photo courtesy Kim Tafoya. 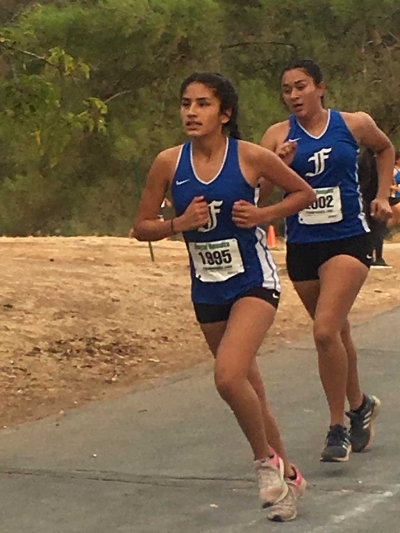 FHS teammates Isabella De La Cruz and Yakeline Magaña as they compete at the third league mini-meet to qualify for CIF Section Division 4 Prelims. Photo courtesy Kim Tafoya. Cecilia Cisneros. Photo courtesy Kim Tafoya. 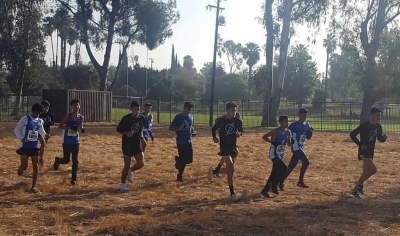 On Thursday, November 2nd, Fillmore Cross Country Teams competed at the third league mini meet to determine league standings, and which Varsity teams earned their way to compete at CIF Southern Section Division 4 Prelims. The Meet was held on the challenging Lake Casitas Course in Ojai. Eleven boys teams competed and ten girls team were represented. In the boys junior varsity race Fillmore finished in second place. They were led by Juan Ramirez in 8th place, posting a time of 17:32.13, followed by Rey Andres Laureano 10th in 17:45.05, Jesse De La Cruz 11th in 17:45.7, Davis Flores 17th in 18:01.43, Jesus Castro 18th in 18:06.87, Jesse Martinez 19th in 18:07.51, Matthew Munoz 26th in 18:33.95, Juan Carlos Laureano 29th in 18:39.69, David Bustos 37th in 19:18.25, Mario Hurtado 42nd in 19:24.53, Alexander Recancoj 43rd in 19:28.96, Jorge Acevedo 48th in 19:42.91, Eric Hernandez 51st in19:45.29, Antonio Villalobos 55th in 19:53.42, Alexander Manzo 59th in 20:02.91, Joseph Magdaleno 62nd in 20:15.82, Luis Leon 64th in 20:17.82, Gustavo Valdez 71st in 20:52.71, Daniel Cruz 79th in 21:18.91, and Andres Gonzalez 110th in 25:26.47. In the boys varsity race Michael Sanchez led his team to a third place finish and a CIF team qualification capturing a 10th place finish in 16:39.29 , he was followed by Everardo Garcia Magana 13th in 16:50.08, Sergio Perez 20th in 17:15.37, Fabian Del Villar 24th in 17:46.83, Jonathan Ordaz 31st in 18:04.05, and Nick Villela 33rd in 18:05.38. In the girls junior varsity race Allison Recancoj led the girls to a second place team finish by crossing the finish line in 9th in a time of 22:11.84, followed by Ebony Venegas 10th in 22:31.89, Jacqueline Ruiz 14th in 22:53.18, Jacqueline Chavez 15th in 22:53.76, Lorena Izarraras 16th in 22:53.99, Emma Orozco 18th in 23:10.47, Michelle Reyes 24th in 23:48.73, Isabela De La Cruz 25th in 23:49.47, Yakeline Magana 33rd in 24:59.96, Liliana Felix 40th in 25:22.91, Aliyah Heredia 26:20.07, Marisol Ramos 56th in 28:22.72, Emma Ortiz 59th in 29:35.37, and Eva Vieyra 60th in 29:42.48. In the Varsity girls race Carissa Rodriguez finished in 6th place in 19:19.16, she was followed by Diana Perez 8th in 19:43.4, Vanessa Avila 14th in 20:27.21, Giselle Perez 26th in 21:34.59, Nicole Gonzalez 27th in 21:43.3, Anahi Pascual 28th in 21:43.46, and Cecilia Cisneros 31st in 22:02.12. Carissa was the top individual finisher for the Fillmore teams and the girls varsity captured a qualifying spot into CIF Southern Section Division 4 Prelims as well. The Boys Varsity and Girls Varsity Cross Country will travel to Riverside, California to compete in the CIF Southern Section Division 4 Prelims on Saturday, November 11th. The races will commence at approximately 7:45 AM.